All of the pictures above have been taken in our workshop during the walnut blasting process. 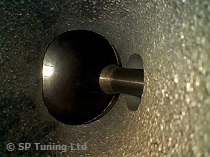 Walnut Blasting is a safe method of removing carbon deposits from the inlet tract and inlet valves using fine granules of walnut shell which are blasted at high speeds using specialist equipment. 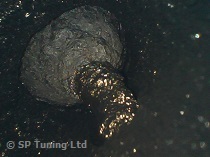 When blasted at high pressure the walnut shell granules are very effective at completely removing carbon build up but are soft enough to not cause any damage to the lining of the inlet tract and valves. 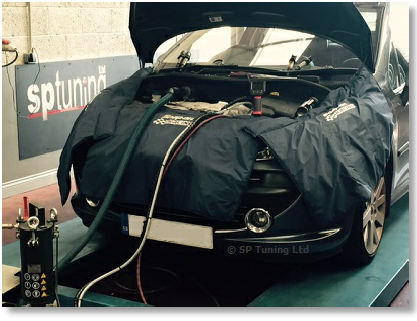 This is a very cost effective method of carrying out this procedure as the requirement to remove vehicle components is minimal. 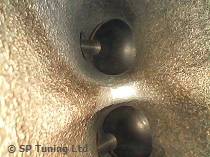 Many modern engines are direct injection which have a dry intake system. In addition these engines have an increased compression ratio to maximise efficiency of the turbo and also run very high fuel pressures. The increase in compression pressure generates heat and this increased working heat contributes to the problem of the coagulation of suspended oil particles which are vented into the dry air intake system. 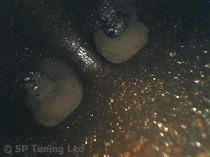 As there is no fuel to wash the air intake system overtime this leads to a build up of carbon deposits in the intake tract and on the intake valves. As this build up increases the valves are unable to function properly and this will have an effect on the running of the engine. Symptoms such as loss of power, hesitation on throttle repsonse and decrease in fuel economy may be noticed. This carbon build up can not be prevented by adding chemical additives to fuel as the fuel does not come into contact with the intake tract or valves. Injecting methanol/water into the dry air intake system and using premium fuel may help to slow down the build up of carbon deposits but will not prevent it. From the first drive after the walnut blast has been carried out you will notice restored driveability, with reduced hesitation and restored power and fuel efficiency. You may also notice that the idle will be smoother. 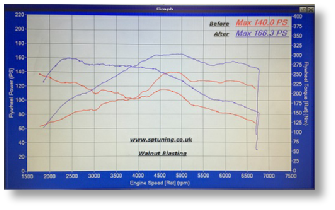 Of course the greater the carbon build up the more improvement you are likely to feel, an engine is usually ready for a walnut blast from around 25,000 miles. This dyno graph of a vehicle before and after a walnut blast shows restored power and smoother acceleration.